With shorter days and colder mornings come lower ambitions. Feeling more tired than expected after Oso, I spent some time exploring the lesser peaks of southwestern Colorado. While the region’s rock is not usually good for climbing, and its geological history has not created jagged peaks and sheer faces, there is both some interesting geology and an extensive network of forest roads and trails through the turning aspens. This 12,000-er lies at the southeast corner of the main San Juan range, standing above the northern New Mexico plains. From the town of Pagosa Springs, it is a long drive on good dirt roads followed by a short hike up a jeep road and a steep use trail. With a capable high-clearance vehicle, it is an extremely short hike from the unmarked but obvious “trailhead” along that road. Though surrounded by various basalt crags and rubble-mounds, the upper peak is a blob of tuff hard enough to overhang slightly on its southwest side. I got a late start on the west-facing approach, starting my hike up the jeep road just after another group in a pickup started driving it. The aspens were slightly past their prime, and the road was often covered in golden leaves just beginning to rot. When dry, the first half-mile of the road would be drivable in most passenger cars, but it quickly gets worse, with slick mud, large boulders, and deep ruts. As the road winds its way up Little Pagosa Creek around the south side of Black Mountain, the peak comes into view through the thinning forest. Where the road switchbacks away from the creek to the southeast, the steep, semi-improved trail continues along the creek. Making the split even more obvious, I met the men in the truck I had seen earlier. Though they had impressive driving skills to get an apparently-stock Tundra up the lousy road, their lowland cardiovascular skills were lacking, and they had turned around below the summit. 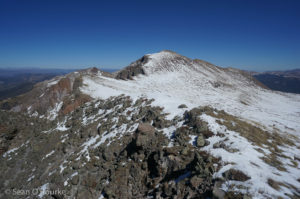 I followed the well-marked trail to the peak’s south ridge, then along the crest past one false summit. I briefly considered the summit views on this unseasonably-cold day, then hike/jogged back to my car for a late lunch. 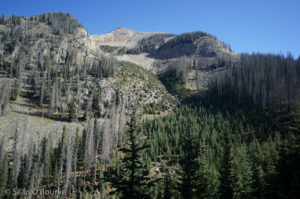 This unimaginatively-named peak is the high point of Archuleta County, the highest of a cluster of three 13ers in the South San Juan wilderness between Pagosa Springs and Chama. While most people reach it via a long series of dirt forest roads leading to the east side of Elwood Pass, I came at it from the west, via the East San Juan River and the Quartz Creek trail. The river road continues to form the west side of the pass, used by the old army road from Fort Garland to Pagosa Springs. At around 11,700′, Elwood Pass was never easy to cross, and it was long ago abandoned in favor of Wolf Creek Pass to its northwest. With some unease, I drove through the San Juan river, then made my careful way up the dirt road to Quartz Meadow, where I spent a very cold night. My water jugs had partially frozen, but there was enough liquid for two cups of coffee while I waited for the sun to reach the valley floor. I impatiently started shortly before it did, then had to jog until I could stand in the first sunny patch for 10 minutes to warm myself. The Quartz Creek trail is in a pleasant state of neglect, still mostly runnable, but clearly unmaintained for a decade or more. I do not understand why it was ever built: the side-creek it climbs to reach the Continental Divide Trail at a plain above 12,000′ is steep, narrow, and loose, and there are no signs of mining in the valley. 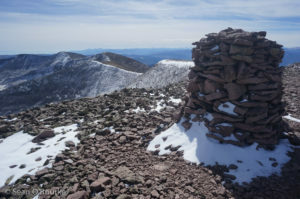 I followed it up through the woods to the southwest end of a sloping basin west of Summit Peak, then followed a sparse line of cairns across the meadow to pick up the trail’s fading continuation over the divide. There was more snow here than I expected, and it became more frustrating as I climbed, with a breakable crust over 1-3 inches of powder. Where the trail wanders south over the plain, I headed straight for the slightly less snowy ridge. This required crossing a minor subpeak south of Summit on some gnarly conglomerate, but it was probably faster than following the snow-covered CDT. I signed the register (in a salsa bottle), then considered my next move. My original plan was to continue north to the other 13ers, “Unicorn” and Montezuma, then jog back via the CDT. However, most of the way out and the entire way back would be a miserable slog in the crusty snow, so I decided that one peak was enough. Returning along the ridge, I dropped from a notch down a steep scree-slope which had some game trails near the top. This turned out to be sketchier than expected, with sections of hard-packed dirt and, lower down, unpredictably hard snow threatening to send me for a ride. Still, it was probably faster than retracing my steps. Happily back on the trail, I hiked and jogged the return, then relaxed after safely driving back through the San Juan. I had been saving this unnamed centennial peak near Creede for a winter or spring trip, but when my weekend plans changed, I decided to make the short detour north to tag it. Tiny Creede sits at the mouth of a box canyon, with two tall crags just past the north end of town. It seems to have turned itself into a Texan tourist destination, with several small restaurants and gift shops along its main street. I drove straight through, then up the narrow canyon of Willow Creek to camp near the trailhead. The route starts off along a rough jeep road to Phoenix Park, then follows an old stock driveway up East Willow Creek to treeline. The route is little more than a cairned use trail now, and its lower section has been completely obliterated by a ridiculous maze of beaver dams. Once out of the trees, the driveway disappears completely, and a faint climbers’ trail continues up a ridge to the peak’s broad south face. Though many neighboring slopes are wretched talus-heaps, it is possible to stay mostly on grass to the saddle just south of Phoenix. From there, it is an easy boulder-hop to the giant cairn on the flat summit. I had contemplated traversing south to La Garita and returning via Halfmoon Pass, perhaps visiting the Wheeler Geologic Area along the way. However, it looked like much of the traverse might be loose talus, and trail 787, my planned return, apparently no longer exists. The cross-country loop sounded too much like work, so I instead retraced my steps for another short day.